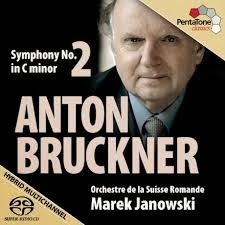 Marek Janowski’s revisionist approach suits some of Bruckner’s symphonies better than others. To date, the highlight of his cycle has been the First Symphony (Fanfare 36:4). That’s a work that requires a great deal of help from the podium, and receives it from Janowski in the form of brisk tempos, clear textures, and sharply focused structural aims. The Second Symphony is more self-sufficient and handles, even invites, more expansive and indulgent readings. But Janowski again demonstrates that lean textures and propulsive tempos can suit early Bruckner. His attention to detail helps the ear make sense of the often unorthodox orchestration, and his continual resistance to grandiose extremes brings the scale of the music into line with the shorter timescale of each of the movements. In fact, Janowski is freer here in his tempos than he has been in most of the previous installments in the cycle. He still doesn’t overdo the rubato to shape the phrases, but at this local level there is more give and take than we are used to from him. More significantly, he is also prepared to make the gradual tempo changes required at the transitions and in the preparations for significant cadences. A sense of tight control continues to pervade all his tempos choices, but for once the music is given a chance to breath. The quieter sections of the first movement, including the very opening, have a real sense of mystery, as if, for once, Janowski is allowing the music to retain some of its secrets, to be gradually revealed later on. As ever, the Orchestre de la Suisse Romande gives Janowski all refinement and sophistication that asks for. The string tone is velvety and complex, but also has the timbral focus required for this kind of reading. The only disappointment in the first movement is the more dramatic music in the development. Janowski’s insistence on control and moderation cause most of the climaxes here to either fall flat or stop just short of the full power they are crying out for. The Andante second movement is typical Janowski, brisk and even throughout. Perhaps this movement is a little lacking in atmosphere, but the compensation is a Schubertian elegance that casts a new light on the movement. The strict tempos give the music a linear integrity, which is also aided by the very delicate balancing between the sections. The solo horn is a particular delight, but is just one of the many refined details of this elegant, chamber-like reading. Janowski acts against type in the scherzo by delivering a remarkably slow reading. It’s never ponderous though, but instead deliberate and with the notes fully-voiced, rather than just punched out as accents. Quite what his motivations are here it is difficult to tell, but as with the Andante the result is an increased sense of linearity. By playing with full note values—although not necessarily legato—the violins are able to dominate the orchestra and maintain a single, coherent melodic line from beginning to end. In the finale, Janowski again searches for the ideal balance between detail and structure, and between clarity and drama, while always favoring dryer, narrower textures, even when the music seems to demand greater power. His approach to the conclusion is interesting, bringing both the tempo and dynamic down to virtually nothing after the trombone chorale and then affecting a huge build-up into the final bars. That’s not like him at all, and is daring by any conductor’s standards. Such a conclusion might sit comfortably in a more effusive reading, but here it seems out of place. Even so, this is one of the more satisfying and interesting of Janowski’s Bruckner recordings to date. It is of a piece with his earlier installments, but is more daring in many ways, not least in the more flexible tempos and atmospheric quiet textures. But, as ever, these details appear within a tightly controlled framework, in which structure always has precedence over expression. If you’re sympathetic to Janowski’s approach, this is definitely worth hearing. If you’re not, it might be the first step towards changing your mind. This review appears in Fanfare Magazine, issue 37:2.